At last the sun came out, so a spot of lazy camping was called for, – we set out with the simple aim of only eating and sleeping and drinking tea. We visited Forestside Farm that is set in the beautiful Staffordshire countryside providing wonderful views of the Dove Valley and Weaver Hills. We always like to find destinations that are small, clean, friendly and peaceful. Chris and Jan Prince have certainly ensured their campsite ticks all these boxes, the site itself is on a working organic dairy farm and we have had a great time walking around looking at the new calves, – you really do feel like you are in the heart of the countryside. We have been visitors to Forestside a number of times as it offers us the ideal base for a short break. 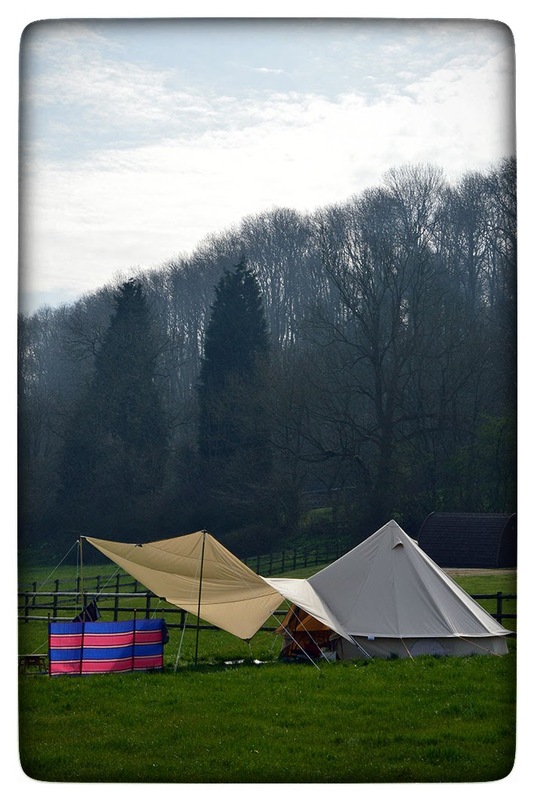 This time we took out our new wing tarp for the bell tent, as we could choose where we wanted to pitch up and with plenty of room to spread out it gave us the perfect opportunity to experiment with it. The Forestside site is very simple, but we find it perfect. On the edge of a hill sheltered from the winds by the woods behind and fantastic views to the front, there is plenty of wildlife to be seen and heard. We think it is a little corner of paradise, ideal for enjoying all the great scenery to be taken in over a glass of wine. We have also just returned from a wonderful couple of days at Shallow Grange Farm, that is found in a great location in the Peak District between Bakewell & Buxton. This site is a working sheep farm so lots of gambolling lambs this time of year. This was our first time at this campsite and the field we were in was lovely and flat, with picnic benches dotted around and beautiful dry stone walls with views across the farm’s sheep fields. The picnic benches were an unexpected added bonus to eating alfresco. We’ll be looking forward to going back again later in the season.